Join the Trust on a walking tour through historic Hyde Park. 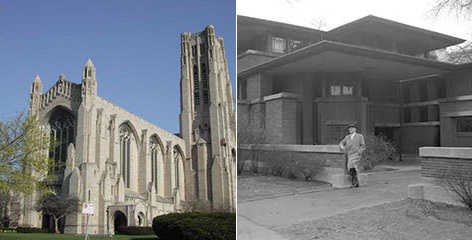 From its roots as host to the famed White City of the 1893 Columbian Exposition, Hyde Park is now the culturally diverse home of the University of Chicago and Wright’s Robie House. Guests will explore the harmony and dissonance of nature and structure – a neighborhood in concert. Frederick Law Olmsted’s park system serves as canvas to architectural marvels such as Bertram Goodhue’s towering neo-gothic Rockefeller Chapel, Wright’s iconic Prairie style masterpiece, David Swan’s post-modern residences, and more. Tickets available for purchase by calling 312.994.4000 x1. $15 Wright Plus Member Ticket holders only.